A Growing Dance is a personal investigation into the body of the mother-artist, through the interaction with sculptural cloth forms. 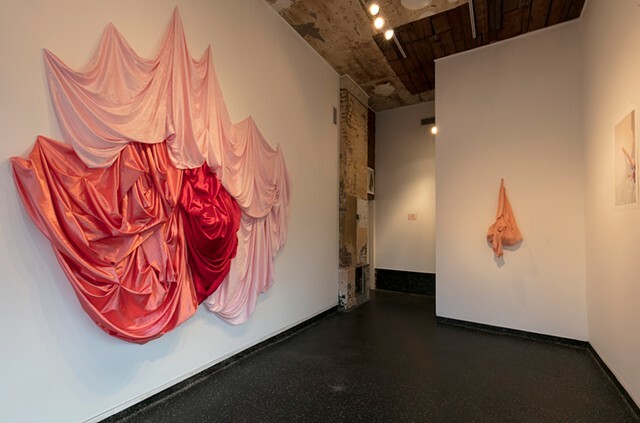 As a child, I remember walking through grand art galleries with my own artist mother; I became fascinated by how folds of cloth could be rendered so seductively, in paint or in marble. Later, in art school, my research into drapery continued: I became aware of its many loaded cultural, historical, and metaphorical significances. 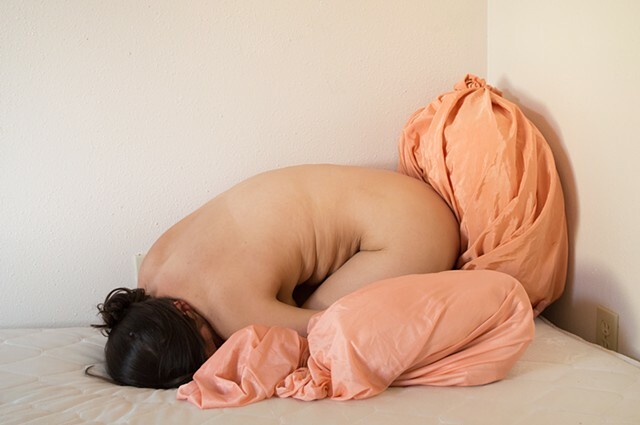 In A Growing Dance, I am most interested in the parallels that can be drawn between draped folds and folds of flesh. At once the material can be both something which hides or reveals, and act as a symbol of, the body. This duality has been at the core of my experience as a mother thus far - how I represent myself physically on the outside usually feels far removed from where I am emotionally, on the inside. Often it feels like my body has been given over to another, it is no longer mine. At the same time, I know it to be a site of tremendous strength and power, a life-giving vessel. The dance-like movements captured in this series of images have been inspired by the everyday actions - bending, stretching, reaching, twisting - I make whilst caring for my daughter. Appearing both alongside my body, and separately, on its own, is the predominantly flesh-toned drapery: using satin (like my grandmother’s bedsheets), velvet (like my favourite childhood outfit), and other found fabrics, the drapery is given form using unseen materials such as mine and my partner’s hair, our outgrown clothes, and pillows from our bed. Always there during this process, but also hidden, is my daughter. Through thoughtful titling I remind the viewer of her presence.